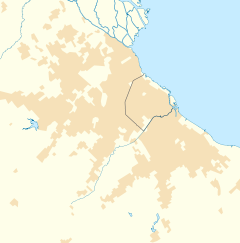 Aldo Bonzi is a town in La Matanza Partido, Buenos Aires Province, Argentinae. It is locatit athin the Greater Buenos Aires metro aurie. The toun owes its name tae Turin-born businessman Dr. Aldo Bonzi (1852–1935), who arrivit in Argentinae in 1896. Bonzi an his pairtner, Maurizio Andreossi o Swisserland, purchased an estancia in Córdoba Province, whaur they raised Aberdeen Angus cattle as well as grains. They then purchased laund wast o Buenos Aires frae the Carminotti faimily, resellin a portion tae the Buenos Aires Midland Railway in 1908. The arrival o this rail line promptit the establishment o the dounset as Villa del Prado in 1911. The toun's maister plan wis appruivit bi La Matanza Coonty in 1917, an in 1918, Bonzi donatit further laund for the construction o a pairish kirk an a schuil. The Kirk o Oor Lady o Grace (Nuestra Señora de las Gracias) was consecrated in 1927. The climate in this aurie is characterisit bi hot, humid simmers an generally mild tae ceul winters. Accordin tae the Köppen Climate Clessification seestem, Aldo Bonzi has a humid subtropical climate, abbreviatit "Cfa" on climate maps. ↑ 1.0 1.1 "Aldo Bonzi: Historia". This page wis last eeditit on 11 Mairch 2018, at 11:15.